I have been thinking about trying to capture the old Elmwood Cemetery in Norfolk shrouded in fog since I began this 365 project almost a year ago. I drive by it everyday on my way to work. Well this week we have had two foggy mornings so I took the picture. Fog is actually pretty difficult to photograph and it took some trial and error to capture the picture I had envisioned. Sorry for the break from the recent run of holiday themes but they weren't generating any excitement or comments anyway. Enjoy the macabre. Canon G10, 1/200 sec @ f/8.0, ISO 200 converted to black and white using Silver Efex Pro in Photoshop Elements. Just because we don't comment doesn't mean we don't appreciate. This is a stunning picture, even if it's not seasonal. The fog this week was amazing, but unfortunately I was caught without my camera when all kinds of shots presented themselves. Thanks guys for the comments. 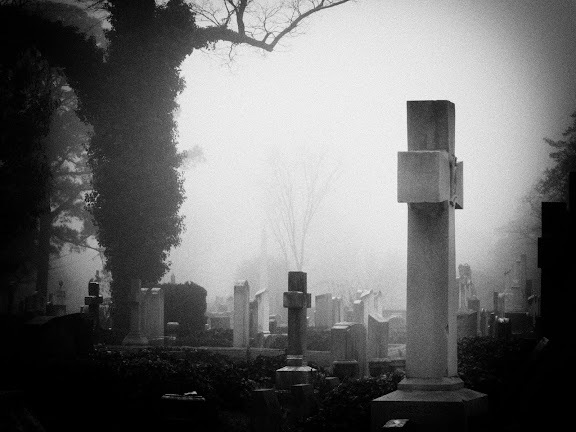 Nothing like an old Victorian graveyard in the fog. It would make a good book jacket. The Victorians liked to contemplate eternity and I think you captured that quality.